David Korten has sunk his stake in the ground and declared that “it’s time we the people declare our independence from the money-favoring Wall Street economy” in his latest blog 10 Common Sense Principles for a New Economy. Let me just say upfront that I’m a fan of David Korten. He’s a really smart guy – a former Professor at Harvard Business School – and he’s written more books than I’ve grown fingers. So, all props, kudos and respect to him. I really liked the now almost impossible to find 1984 book he co-edited with Rudi Klauss – People-Centered Development: Contributions Toward Theory and Planning Frameworks and his ideas in The Great Turning: from Empire to Earth Community deserve a broad reading. He co-founded YES! magazine that seeks to “reframe the biggest problems of our time in terms of their solutions“… and outlines “a path forward with in-depth analysis, tools for citizen engagement, and stories about real people working for a better world.” This is good stuff! He also lives in Bainbridge, WA, which is infinitely cooler than living in say D.C. or Geneva. 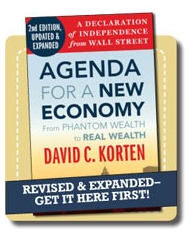 The blog post is linked to the release of the second edition of his most recent book Agenda for a New Economy: from Phantom Wealth to Real Wealth (or A Declaration of Independence from Wall Street.) The basic ides is that America needs a new economy, one that is fair and works for people and the planet. 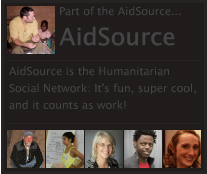 My response to his blog is one of those instances I warned you about on the About this blog page: “I reserve the right, of course, to occasionally wander off course and comment on other topics related to this blog’s broader theme of international development.” What follows is Korten’s complete blog in purple text with my comments inserted in black italicized text. I agree with your first sentence, but I think you needlessly demonize Wall Street financiers, few of whom profit from or desire the items on your list. A positive expansion of the opening statement would be more effective and convincing. This is a very intriguing twist on the gross domestic product as an indicator of economic health and progress. Of course, what you are implying by this is the need to monitor a new indicator made of two parts, the GDP as numerator and the GHI (gross happiness index) as denominator. (GHI/GDP). This would measure how efficiently a society can produce well-being and happiness. This would also make a nice proxy to measuring the sustainability of the national economy – a truer measure of economic health and progress. I realize that you’re using “Wall Street” as code for the current economic, political, and social realities in America, but I don’t think it serves you well here. It just doesn’t make that much sense. Looking at three of the things “the Wall Street economy wastes enormous resources on”: 1) War is not a unique feature of the modern American economy. 2) Our penal code has more to do with the way our democratic political system works than how our economy is structured. 3) High advertising expenditures result from the interplay of freedom of consumer choice and firms competing freely in the open marketplace – two freedoms that society will continue to value. Some advertising certainly leads to higher quality of life – consider the advertisements that will make readers aware of your book. Markets allocate efficiently only within a framework of appropriate rules to maintain competition, cost internalization, balanced trade, domestic investment, and equality.These are essential conditions for efficient market function. Without rules, a market economy quickly morphs into a system of corporate monopolies engaged in suppressing wages, exporting jobs, collecting public subsidies, poisoning air, land, and water, expropriating resources, corrupting democracy, and a host of other activities that represent an egregiously inefficient and unjust distribution of resources. Wall Street would say that it reallocates money from over-financed and underproducing entities (rich investors who otherwise keep their money stuffed in a mattress) to under-financed and highly-productive entities (e.g. Apple Inc., SKS Microfinance, etc.) But, given our recent history and the gouging of my mechanic father’s retirement fund, the expropriation of real wealth from the rest of society sounds more plausible. Disagree. You can create money with an accounting entry, but not wealth. Populist leaders have tried this and discovered that it leads to the devaluation of money (i.e. inflation) and, when taken too far, leads to hyper-inflation, which is catastrophic to society at all level, but especially to the poor. If you increase the money supply without some real underlying growth in the economy, you end up looking like Bolivia in the mid-80s, Yugoslavia in the mid-90s, or Zimbabwe a couple years ago. Rather than increasing the money supply (adopting an expansionary monetary policy), a more appropriate tool would be an expansionary fiscal policy. Of course, this only really works if you invest in things with real financial and social returns, like education and infrastructure rather than say expanding two wars in the Middle East. And, it is important to note that this implies running a deficit, so this can’t be overused or our grandkids are all screwed…well, they may already be. You unfortunately contradict yourself here. You just suggested in principle #6 that we should use creative accounting to create money from nothing to serve a valid social purpose. That said, I agree that this sort of activity should be and can be reduced through appropriate regulation. Amen, and amen! Maybe your list of principles should have just been this. I want to agree, I think. But I wonder if economies of scale could ever be reached if all the financial and legal risks of large enterprise had to be carried personally by business owners. The ability to grow a business large enough to produce things like airplanes and computers that common people can afford could be seen as a reasonable public purpose. And how should government decide which businesses or products produce sufficient public good without turning into some kind of politburo? I enjoyed the analysis of Korten economic “principles”, and enjoyed your site overall. Of course, this hits it right on the head. Indeed, I have never understood the Make-more-money-with-a-pencil theory. Although, I have had a few economist friends attempt to prove to me that its not pure destructive chicanery. As one military officer said to me – “If I paint this footlocker blue, and put a TV on it, my wife will not believe its an entertainment center.” The same holds true with the pencil monetarians and I am glad to see you take it on. This was definitely a rant on Dr Korten’s part…in which I see the hyperbole, yet still resonate with his frustration at the intersection of amoral profit motive and human selfishness. Once the people inhabiting that intersection become powerful…all hell breaks, and has broken loose. I wonder…Does he come from a utilitarian approach to justice? I believe that strong moral fibre + utilitarian beliefs = a politburo sooner or later. Then, with increase in power, the moral fibre cannot hold back the aforementioned selfishness, and capitalists gloat. My MBA father stated axiomatically that wars were good for business, and that WWII pulled us out of the depression, and Korea, then Viet Nam fueled the American dream through the 50’s and 60’s. Couple that with General/President Eisenhower’s warning about the industrial military complex, the incredible defense spending, and I think you could make a case that war is an American forte, even if not exclusive. Add to that the present wars…why are we there? My father also said you don’t get paid well in advertising or sales by selling what people need. As he demonizes Wall street, i am reminded of a silver bullet that hit me as i read a report on the stock market, speaking of ” investor confidence” as if it was something of real value, to be guarded like the gold in Ft Knox. The silver bullet was that a con man…a confidence man…trades investor confidence for cash…a jail-able offense. Old time professors like this are really interesting to me – I haven’t read anything else of his, but I am guessing it was not this type of literature that got him in the door at HBS. I’ve had a couple professors who were at one point similarly accomplished with critical works on international political economy and the like and then somewhere along the way got a little soft and traded in their critic’s hat for a preacher’s robe. I think of Michael T. Klare’s work – more a summary of current events than research that expands upon what we already know. I guess the stuff sells though. I’m enjoying your blog in the bits and pieces that I get to it, and it’s great to receive some comments on my own that are more then my mother asking for more photos! Cheers. Relating to # 6 above, creating money with an accounting entry, some could argue that an expansionary fiscal policy is no different from an expansionary monetary policy. Either way, wars can be the engines of economic activity while education and infrastructure suffer. As you say, it depends on what we invest in and clearly social returns aren’t in vogue. From an economic standpoint, social returns aren’t valued unless they are privatized, meaning made to serve profit above all. A good example of this is health care in the US which is very profitable but overall our health is poor. Since the Federal Reserve took over the priveledge of issuing money (1913), we have lived with inflation. The Fed uses the same account-entry method of creating money under discussion, which most people don’t believe. “Lending” money which doesn’t exist is very profitable to those who lend the money since they charge interest. The profit from interest not only creates a kind of debt slavery which has been the model of institutional development agencies, but has also nurtured the casino style mentality that dominates economics today. The role of speculation can’t be overlooked in its role of causing bubbles and hyper-inflation. As you pointed out, money can be created with an accounting entry but not real wealth. This may be true, but the degree to which money has been concentrated in fewer hands with this system means that the rest of us and our society have been impoverished. Impoverished not only economically but politically, which means Wall Street has more decision making power on what we should invest in than you or me. Thanks for your blog. I’m finding good discussions here.